Boy it's been some time since the last post in this series - last September. 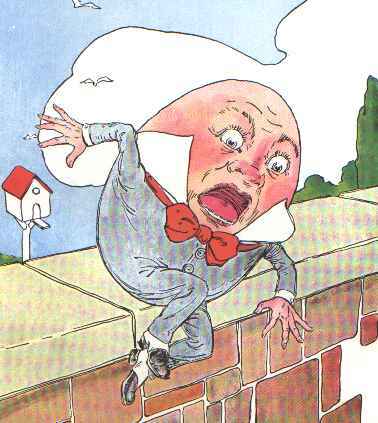 Back in the days when the now defunct Humor Bloggers Dot Com was still a going concern there was a forum thread called The Humpty Dumpty Dictionary Challenge started by my fellow Canadian blogging buddy Frank Lee Mei Dear at I Don't Give A Damn. As well, Jan at The Jannaverse does these from time to time. Before Darth Vader had his lisp corrected Hanth Tholo wath hith nemithith. When the evil wizard Daedalus was looking for his son Dedil he asked "Where's Dedil at? Nice to know I'm not the only one who wonders where these "words" come from. And did you know that I'm your number fandinista? May HBDC rest in peace. I had forgotten all about that thread. I don't use word veri, but they do have some pretty cool and interesting "words". Scraps: I think it's about time we start our own "word-ver" dictionary. Then we'd have a better idea of where the heck these words come from. Quirks: I know you're my #1 fandinista and one of my oldest - not in age, but since I started my blog. My cancer/rocknroll/blathering bloggin' buddy. I'd never forget! Don: Yeah, too bad about HBDC. It was a great place to hang out. I sure hope Chelle's doing okay. Those veri-words can be pretty bizarre! Heh, heh. "Tholo" - that was a good one! Your translation of tholo threw me to a galaxy far away! Brilliant! Not to be all nit-picky, but wouldn't "inerchos" be nachos that tended to remain in motion, until friction thwarted their forward progress? The word that you defined is "sedenchos." By the way, my word is "gracturi," and I was trying to think of a clever one. The best I can come up with is a urologist from Granby, CT.
Also, "tholo" is a classic. 00dozo: "tholo" was my favourite. And you defy with a stutter - iddfi. Jeremy: inertia comes from the Latin "iners" meaning idle. But you're right - the common usage is resistance to change in velocity. Man we're technical here! You're one up on me for "gracturi". I got nothin'. Good stuff. Janna does some great ones too. FYI, my word ver for this post is "saniste". Which would be the most "normal" member of a Mariachi band. "Yo soy saniste, senor, pero to eres mucho loco." Chris: Oh, I think Janna's the master. Georgina: HBDC was a great place to hang out. The Meaning of LIFF's by Douglas Adams of Hitch Hiker's Guide to the Galaxy fame. A funny guy. I'll have to put Liff on my list of "to reads". Love the word ver dictionary idea! (I miss HBDC, too!) Today's word verification here... "dessin"... Darth Vader with a cold, just dessin' (messin') around? Boom Boom: Yeah and I appreciate you being a fandinista, for sure. HBDC was a great place. Too bad it went to that big blog round-up in the sky. Say speaking of Darth Vader, did you see that news story about the guy who robbed a bank wearing that costume. I'm not kidding, now. The headline actually said "Darth Vader Strikes Bank". I guess the poor guy went over to the dark side.